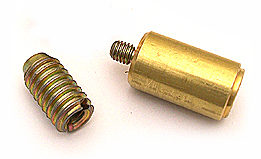 Several types of sash locks are available. The one I like best are actually called window bolts. Sash bolts attach to the top sash and the protruding bolt stops either window opening. They are very reliable, quick and easy to fit but are also very flexible solution as you can position the bolts on the sash so that either the window won't open at all, or open to say 4 -5 inches. The latter allows you to have a window open partially to air the room which is especially desirable in summer months. They are removable with a special key only. The bolts come in two parts. The first bit screws into the window frame. The bolt then screws into this and is removable with a key. If you try to unscrew it by hand it simply spins around. Choose where you want the bolts. I usually have one on each side positioned so the window will open up to 4 inches. Check the fitting instructions to get the drill size right (it's usually a 10mm drill). Drill a hole just deep enough for the bolt housing. With large screwdriver screw the bolt housing into the frame until it is flush with the frame. Tip to get the depth right when drilling wrap a bit of sticky tape on the drill at the depth you want. Tip You should find when screwing the bolt housing into the window frame it's a tight fit. If you find it very difficult use a little dab of washing up liquid to make it easier. If you choose you can buy extra bolt housings so that you can have the bolts in several positions. Set one so that the window can't open at all, and the other so the window will open up to 4 inches.